Today I learned Japanese Christmastime! Today I got a little inspiration for the country of study when I went to see the Hobbit! In honor of that, we will learn about Christmas in New Zealand. The first important thing for us Stateside to remember is that New Zealand is in the lower hemisphere, so when we are getting snow and being pointed away from the sun, they are getting warm weather being pointed toward the sun. Which leads to such hilarious images as santas running on the beach. For those unfamiliar with New Zealand's history, they have an indigenous people, just like the Indians in the United States. The native people of New Zealand are the Maori and the Maori had no idea who Christ was or what Christmas was until European contact. The first Christmas celebrated in New Zealand was in 1814, led by a missionary named Reverend Samuel Marsden. He came in response to an invitation by the Maori on his waka (Boat) the Active to meet the local Ngapuhi along with the other in his mission party. They all sang Psalm 100, a song which encourages people of all lands to get together and sing of God's goodness. Marsden preached to the people and the Maori chief Ruatara provided a translation for the natives. Conversions started out slowly, not picking up in any significant number until the 1830s. Still, in 1842 the Bible was translated into Maori and they began to act as missionaries to their own people. And so Christmas has continued, becoming an official holiday by the 1920s. 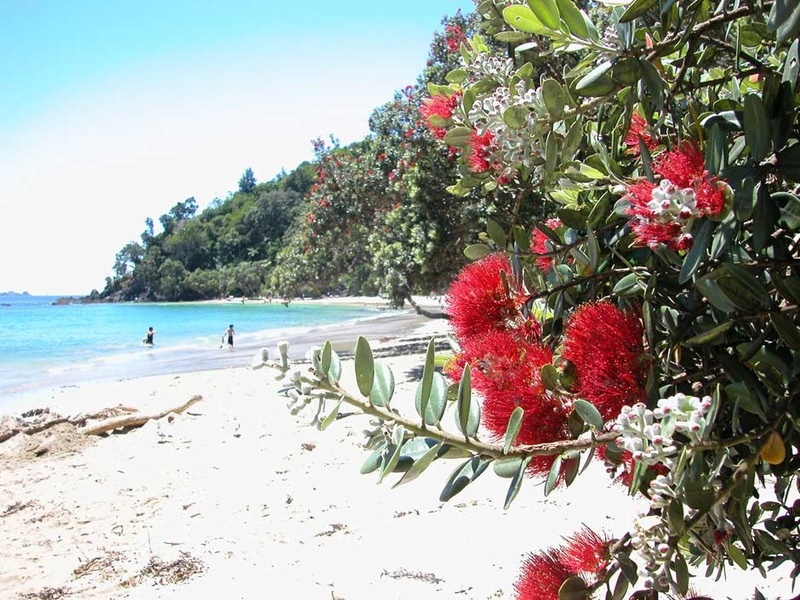 The tree shown above is called a Pohutukawa and has become the iconic Christmas tree of New Zealand. The settlers of New Zealand referred to it as a the Christmas tree, which is how it came to be called that. The tree now features in many songs and poems and graces the front of greeting cards. The Pohutukawa also is prominent in Maori tradition. It is said that Tawhaki, a Maori warrior, attempted to find heaven to seek help in avenging his father. He fell to earth and his blood made the beautiful flowers red. One particularly fun thing the New Zealanders (also called Kiwis!) have done is customizing popular Christmas songs to fit into their culture. For instance, a version of the 12 Days of Christmas was written by King Ihaka in 1981 called "A Pukeko in a Ponga Tree". (Much more fun sounding than a partridge in a pear tree!) There have also been hymns translated into Maori to give them a New Zealand flair, such as Marie Te Po (Silent Night). That he will pull the Christmas sleigh in the southern hemisphere. He will take the starlight trail along the Milky Way. So Sticky Beak will see the way to guide the sleigh tonight. And Sticky Beak will pull the sleigh beneath the Southern Cross. As far as Christmas dinner goes, some New Zealanders make a hangi, which is their version of how Maori cooked in a pit underground while others barbecue for Christmas. Pavlova is important to Kiwi Christmas. It is a fluffy meringue cake with a marshmallow center, topped with fruit. Other traditional foods are much like what we would have here in the States. Ham or turkey with roasted potatoes, pumpkin, kumara (sweet potatoes) and gravy. New Zealand sounds like a rather fun place to have Christmas and I personally wish we had a bird as cool as the kiwi to sing about at Christmastime. I hope everyone enjoyed learning today. Meri Kirihimete!